보카스델토로, 파나마의 호스탈 엘 하구아르 | 호스텔월드에서 예약하세요. 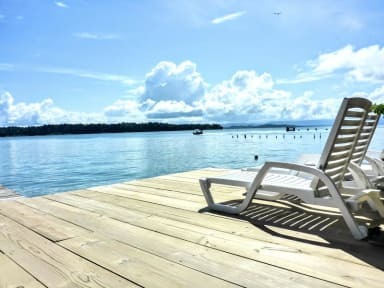 Hostal El Jaguar is built right out over the Caribbean ocean on the calm side of Bastimentos island, which means that you can jump in the water off our dock! The common area is an open air deck over the water which includes our hammock garden, plenty of tables and seating to socialize, two communal kitchens for guest use and a reception area which is also a fully stocked bar. 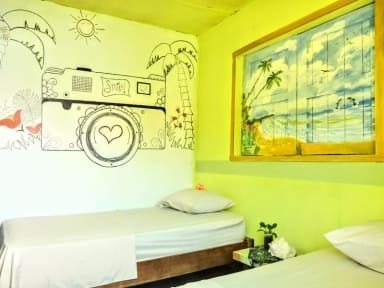 Hostal El Jaguar is one of the best established guesthouses in Bastimentos, and has been owned by an Panamanian native for 16 years who is happy to share his insider information about the area so you get the best tips for your stay. The hostel is in the center of Old Bank town, conveniently located right next to the water taxi dock and just minutes on foot to all the restaurants and supermarkets in Bastimentos. We are a quiet, friendly guesthouse and we pride ourselves on taking care of our guests and making sure they get the most out of their stay!